Standard stock items are subject to a 15% restocking charge. All items being returned for credit must be in their original packaging and in new, resalable condition. We reserve the right to refuse credit for items that were not purchased from Victor Distributing. Credit will not be issued until the item(s) are back in our possession and they have been inspected to determine if they are in resalable condition. We reserve the right to deny returns on closeout and discontinued items as well as any item(s) returned after 60 days from the original sale date. Special order items are not returnable. Warranty returns will be processed in accordance with the manufacturers' specific warranty policies and procedures. Victor Distributing will assist and lobby for the contractor with regards to handling the manufacturers' warranty. Victor Distributing does not claim responsibility for the manufacturers' decision regarding warranty claims. Ultimately the manufacturer has the final say if the warranty claim is refunded, replaced or repaired, and it is their sole decision. Credit to your account will be held until a warranty approval has been received from the manufacturer. 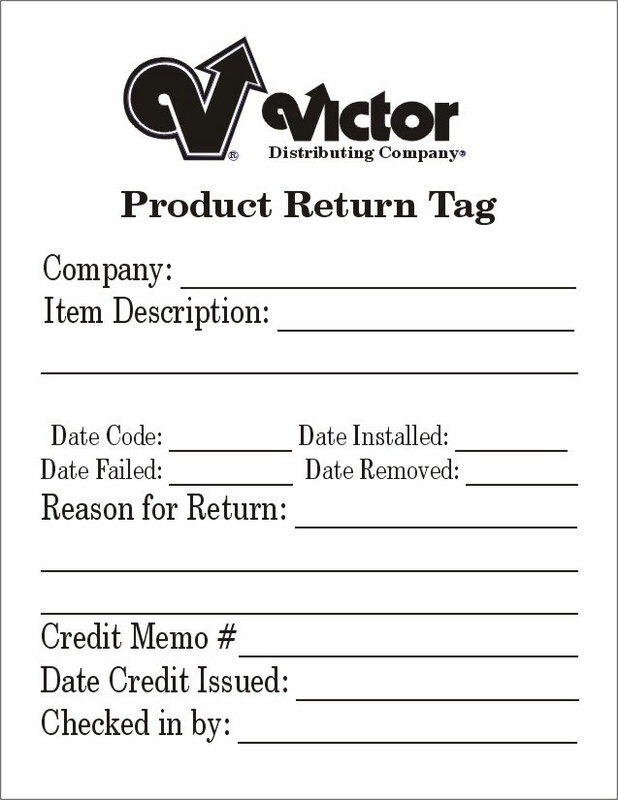 To help us process your return or exchange as quickly as possible please fill out our Product Return Tag completely and turn it in with your return.